Synthetic biology continues to be one of the most wide-spread trends reshaping the conduct of science. Lauded as the potential ‘transistor of the 21st century’ given its transformative possibilities, synthetic biology is the design and construction of biological devices and systems. 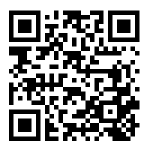 It is highly multi-disciplinary, linking biology, engineering, functional design, and computation. One of the key application areas is metabolic engineering, working with cells to greatly expand their usual production of substances that can then be used for energy, agricultural, and pharmaceutical purposes. Since the nature of synthetic biology is pro-actively creating de novo biological systems, organisms, and capacities (the opposite of the esprit of the passive characterization of phenomena for which the original scientific method was developed), synbio is reformulating the traditional scientific method. While it is true that optimizing genetic and regulatory processes within cells can be partially construed under the scientific method, the overall scope of activity and methods are much broader. Innovating de novo organisms and functionality requires a significantly different scientific methodology than that supported by the traditional scientific method. This includes computational modeling and simulation, engineering practices, feedback loops, automated bio-printing, and a re-conceptualization of science as an endeavor of characterizing and creating. A new science or technology field really starts to capture the imagination and become mainstream when it seeps into art and culture. This is increasingly evident with bioart, bioprinting, and synthetic biology. In bioart (using biological materials to make art), there have already been several phases starting with bacteria drawings in petri dishes and more recently culminating in DNA manipulation, live cells growing into cultured shapes in galleries, and the Algae Opera (an opera singer’s CO2 producing algae in real-time for audience consumption). Bioprinting is an emerging field which marries the 3D printing revolution with biohacking and DIYlabs in the 3D printing of designed human materials for aesthetic and functional purposes. Synthetic biology (the design and construction of biological devices and systems) is being featured in art shows alongside industry conferences and in film festivals, including in its own Bio-Fiction, an international synthetic biology science, art, and film festival series. Not only are we making art with biology as an artistic material, culture is being made in new ways through biology. The theme of biodesign is becoming prevalent as a cultural trope through the rapid expansion of designed biology into the arts, culture, collective human consciousness, and science and technology. These ideas are becoming quite normal, which can only mean that their demise through kitschification and cliché could be coming soon in a subsequent era of anti-bioart, post-bioprinting, post-synbio! 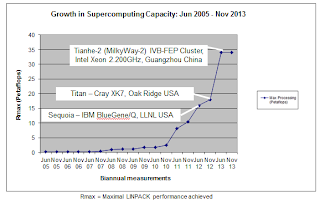 The Top500 November 2013 biannual list of the world’s fastest supercomputers shows China's Tianhe-2 still at nearly twice the capacity of the second fastest, with virtually no change since the machine vaulted onto the list in June 2013. Tech Specs: Tianhe-2 (MilkyWay-2) - TH-IVB-FEP Cluster, Intel Xeon E5-2692 12C 2.200GHz, TH Express-2, Intel Xeon Phi 31S1P. The machine was constructed by the National University of Defense Technology (NUDT). Tianhe-2's maximum processing power is 33.8 petaflops per second (and peak processing speed 54.9 petaflops per second). The nearest competitor is the US DOE's Titan, a Cray XK7 Opteron 6274 16C 2.200GHz with a maximum processing power of 17.6 petaflops per second. 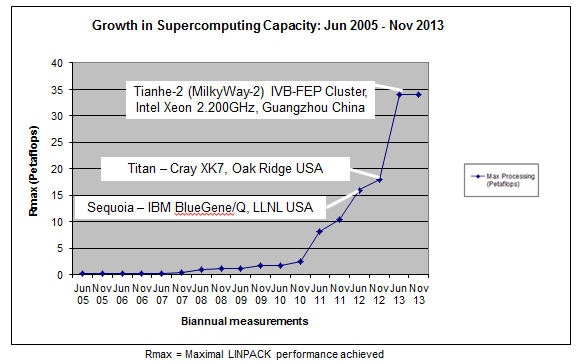 Processing power is firmly on a steep growth curve, accelerating since the 5 petaflops per second mark was surpassed in June 2011 by RIKEN Japan (Figure 1). Supercomputers, although processing faster than the human brain for some time now, process in a massively linear parallel manner which is not at all how the brain functions. However, while not mimicking the human brain, trying to understand it is a key use of supercomputers, along with other traditional prediction problems like weather forecasting, and physics phenomena and energy modeling. Now firmly in the big data era, processing astronomical data too is a key use for supercomputing. Maybe Tianhe-2 will compute findings from lunar data processed through China's recently landed Jade Rabbit. In other astronomical applications, astronomers expect to be processing 10 petabytes of data every hour from the Square Kilometer Array telescope under development in Australia and South Africa with a total collecting area of one square kilometer. 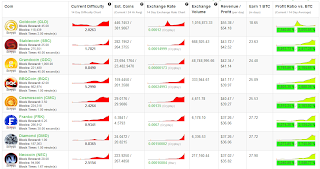 With bitcoin nearly doubling in value in the last few weeks (surpassing USD $400 on November 9, 2013 and reaching USD $937 on November 29, 2013) (see this chart in Figure 1 and the real-time exchange rate), the question is whether it is just another inflationary virtual currency bubble like WOW gold and Second Life Lindens, or a trend that will endure. At present volume is skyrocketing, with a daily turnover (as of November 25, 2013) of 50,000 bitcoin per day (USD $45 million) which translates to USD $17 billion per year. In addition to exchanging physical-world currencies for bitcoin or other cryptocurrencies on exchanges (example: DealCoin), bitcoins can be earned by ‘mining.’ An extensive cryptocurrency mining ecosystem has arisen. Mining or hashing is using home-based GPU rigs (like SETI@home but for crytocoin mining) in resource pools with others (like Coinotron), or renting cloudhashing processing resources, to algorithmically make as many guesses as possible on the number of the next block of coin to be released, sort of like a lottery. There is a safeguard against money-printing and inflation as in the case of bitcoin, only 21 million total bitcoins can be created. 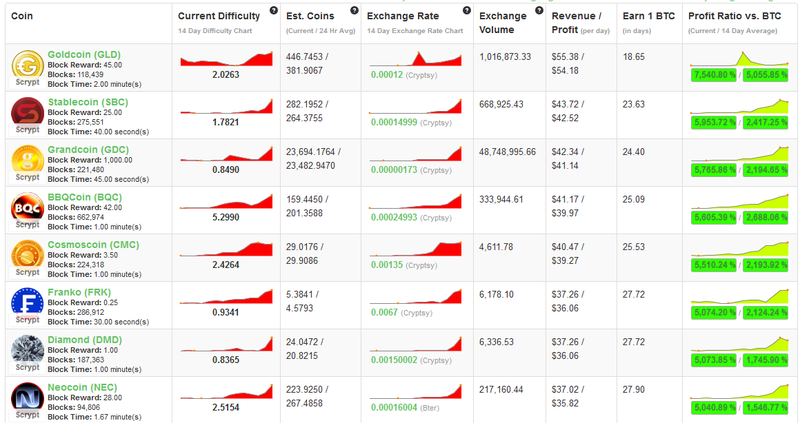 Sophisticated mining operations have driven the profit in bitcoin mining below zero so erstwhile traders mine more volatile currencies that may be up-and-coming like ScryptCoin (USD $27/week profit), MicroCoin (USD $20/week profit) and other riskier alt.currencies that may yield USD $16-$20/day. The reason why a few top cryptocurrencies like bitcoin could succeed are the huge worldwide liquidity of the Internet, the demand for flexible, digital, cross-border, pseudonymous payment systems, and the practical and social political support for peer-to-peer payment systems, financial empowerment, and self-sufficiency as part of the ongoing Occupy response to the 2008 banking crisis, global capitalism, and corporate hegemony. Transfers within the crytpocurrency network are pseudonymous and not directly trackable by authorities, but network ingress and egress exchange to physical-world currencies can be monitored. Regarding regulation and taxation, bitcoin is already being classified as falling under regulatory jurisdiction as a ‘payment system’ or ‘taxable voucher’ and being enfolded into the traditional financial world, with VAT now levied in Germany, Sweden, and Finland, and discussions ensuing in other countries. Bitcoin and the cryptocurrency movement asks ‘who should be in charge of printing money?’ and suggests individuals not governments. Alt.currencies are just another step in the long tradition of decentralization, access, and self-empowerment in the financial industry that includes web-based stock trading and portfolio management, real estate and mortgage transactions, and peer-to-peer lending, and that is also emerging in other sectors like education with MOOCs, and health and biology with citizen science, biohacking labs, and synthetic biology liberating research from institutions. Update: Dec 18, 2013 - With market-crashing volatility and regulatory oversight, bitcoin is already seeming short-lived: "Bitcoin value drops 40% after more bad news from China"